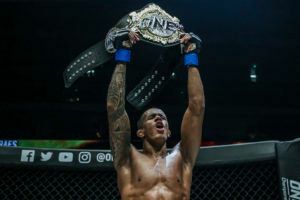 Adriano Moraes was fighting against Geje Eustaquio and a partisan crowd in the Philippines but the Brazilian still managed to get the job done to regain the flyweight championship at ONE: ‘Hero’s Ascent’. 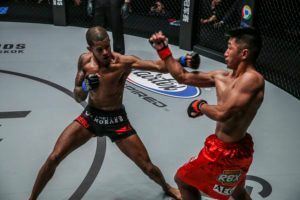 After falling to Eustaquio by split decision last June in a fight that cost him the title, Moraes was anxious to settle his trilogy with the Team Lakay fighter ahead of the upcoming ONE Featherweight Grand Prix that is scheduled to kick off later this year. While Moraes was able to dispatch Eustaquio rather easily in their first fight, the last two matchups have both been razor close affairs leaving a very tough job for the judges to make the right call. It seems this fight came down to Moraes constantly pressuring forward, looking for the takedowns and a couple of near submissions over the course of 25 minutes. Following a back and forth opening round, Moraes and Eustaquio engaged in one of the most thrilling five minutes of action in recent memory as they locked horns in an epic series of scrambles on the mat in round two. For every advantage that Moraes had on the ground, Eustaquio somehow found a way to escape and then punish him while returning fire. As the fight continued, Moraes was constantly looking for openings to get inside and take the fight back to the ground while Eustaquio wanted to keep the action on the feet. In the fourth round, Moraes came closest to a finish when he wrapped up Eustaquio like a pretzel on the ground, pulled back on the Filipino’s leg and extended into a full Suloev stretch. Somehow, Eustaquio survived the submission attempt but he was obviously fighting an uphill battle when it came to aggression and overall time in control during the fight. When the final bell sounded, both fighters seemed to proclaim victory but there was no doubt it was going to be another impossibly tough call to determine who won. The judges sided with Moraes (18-3), rewarding the Brazilian for his constant pressure, takedowns and submission attempts while not absorbing as much damage from Eustaquio (11-7) in return. Moraes now stands tall as the ONE flyweight champion while anxiously awaiting the upcoming ONE Flyweight Grand Prix, which will introduce Demetrious Johnson to the promotion. Johnson will be a heavy favourite to make his way through the Grand Prix and eventually score a showdown with Moraes but first things first the tournament has to kick off on March 31 at ONE: ‘A New Era’ in Japan. 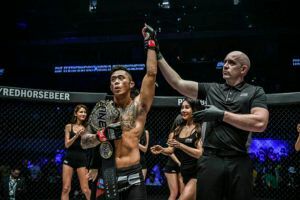 After being forced to the sidelines for nearly three years, Lowen Tynanes returned with a vengeance on Friday in the co-main event as he dismantled and destroyed former featherweight champion Honorio Banario in the opening round matchup of the ONE Lightweight Grand Prix. 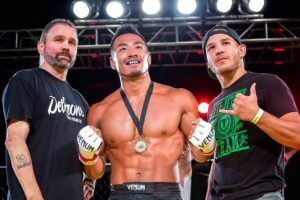 The 28-year old Hawaiian didn’t look like he missed a step in his absence from the cage while dealing with a debilitating back injury that forced him out of action since 2016. Just over a minute into the opening round, Tynanes swooped inside and took Banario to the ground and the Team Lakay fighter never made it to his feet again. Once Tynanes had Banario on the ground, he immediately began chipping away with short elbows and punches while constantly working to improve his position. Tynanes eventually trapped Banario in the crucific with an arm trapped under his legs before leveling with a a series of brutal elbow strikes. The referee kept a close eye on the action and looked like he might stop it but Banario was able to explode out at the last second to avoid the TKO. It was a very brief reprieve as Tynanes dragged him back to the crucifix position almost as quickly as Banario escaped. 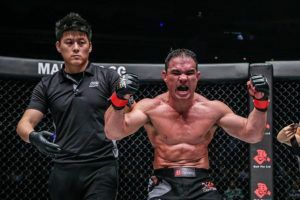 This time around, Banario tried to avoid the strikes by rolling away but that only allowed Tynanes to take his back, lock in the hooks and then flatten out the Filipino fighter on the mat. From there, Tynanes (10-0) started dropping bombs from the top with each shot doing maximum damage and Banario (14-8) doing nothing more than holding his hands over his head in hopes of surviving the round. That was enough for the referee to stop the contest with Tynanes earning the win via first round TKO. Now Tynanes will advance in the ONE Lightweight Grand Prix where he awaits the winner of the upcoming fight between former UFC champion Eddie Alvarez and Timofey Nastyukhin, who meet at ONE: ‘A New Era’ on March 31 in Tokyo, Japan. Danny Kingad punched his ticket to the ONE World Flyweight Grand Prix with a hard fought unanimous decision victory over Tatsumitsu Wada. 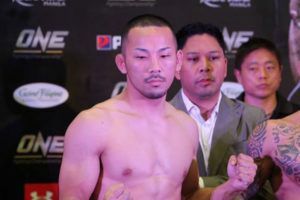 As the flyweight tournament prepares to kick off later this year, Kingad wanted to get a win while also hoping to put on a show in front of a home audience in the Philippines. 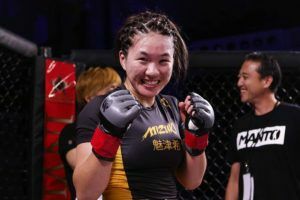 While he was definitely looking for the knockout on the feet, Kingad showed a willingness to engage with Wada on the ground as well during some crazy scrambles after the two fighters hit the mat. 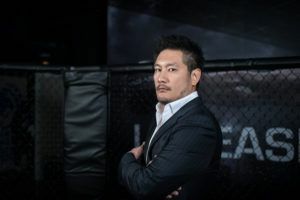 Kingad nearly locked up a rear naked choke in the opening round after jumping on Wada’s back and immediately gaining a dominant position on the Japanese fighter. Kingad came close to getting his arm underneath the chin to wrap up the submission but Wada continues to move and avoid his attempts before working his way free. 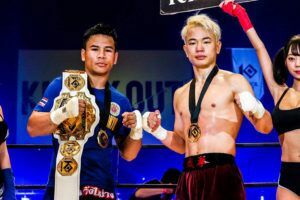 Rounds two and three were a back and forth affair that saw Kingad and Wada both have their moments with huge exchanges on the feet and on the ground. 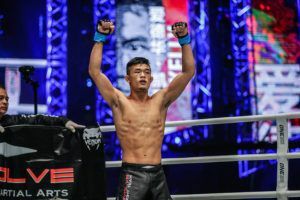 Ultimately it was Kingad’s offensive output that made the difference as he was landing shots with more regularity and then pushing the pace every time the scrambles ended up putting the fighters on the mat. 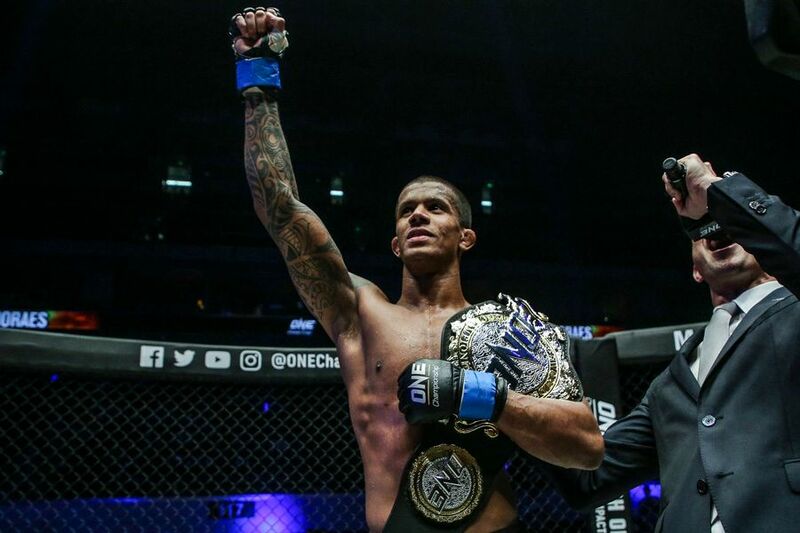 Kingad (11-1) now enters the ONE World Flyweight Grand Prix alongside former UFC champion Johnson, who will make his ONE Championship debut in March. Wada drops to 20-10-2. 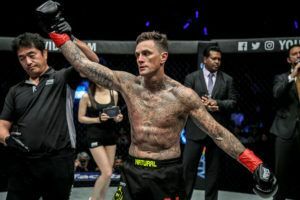 A new middleweight contender emerged on the main card as Dutch fighter Reinier de Ridder made his highly anticipated ONE Championship debut and did not disappoint with his performance. After dragging opponent Rong Fan down to the mat during the opening exchange, de Ridder was quickly to start applying his world class grappling game on the ground. As much as Fan tried to scramble free, he was ultimately just putting himself into a worse position as de Ridder grabbed onto a front headlock and immediately latched onto a D’arce choke. Once de Ridder had his arms secured around Fan’s head and arm, he rolled to his back and continued to twist his body until he had his opponent in an inescapable position. 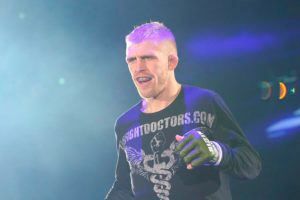 The end came just a few seconds later as the fight was stopped and de Ridder jumped up off the ground to celebrate his latest submission victory. The 28-year old Dutch fighter is now 10-0 in his career with a 100% finishing rate during his career while becoming an immediate threat to middleweight champion Aung La N Sang. Fan drops to 12-2.